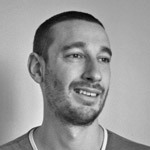 Coming back from a bit of a break, my goal was to chip away at the project over autumn and winter. I decided that every afternoon I could I would spending trying to achieve ‘something’, big or small on the house (which it turns out is easier said than done!). Thanks to Richard and Jake for your continued assistance and a HUGE shout out to Brady for the work (/therapy) sessions and to Carly for your support as always. It means a lot. I started by making some big holes in the walls! These are to accommodate the kitchen and shower room extractor fan vents. 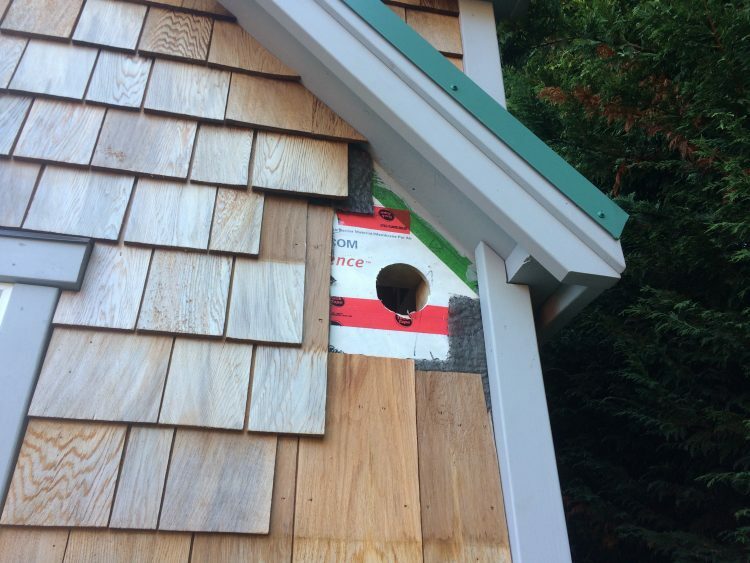 This involved ripping off shingles, making the hole, sealing in the vent cover and then re-shingling. 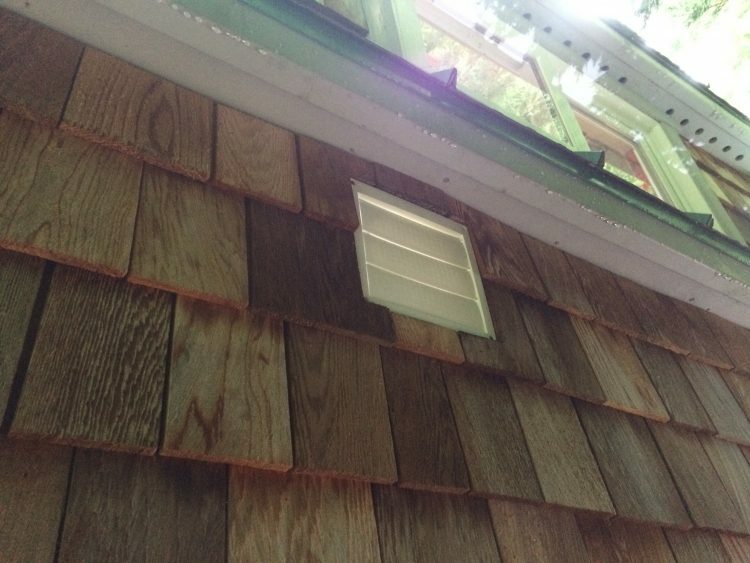 After last year I am pretty well practised at shingling, so this was a nice job to get me going. Next Richard gave me a hand installing the last beam which will hold up the loft. This will be exposed in the shower room, so we went for some rustic hardware and I sanded the bean down until it was smooth. 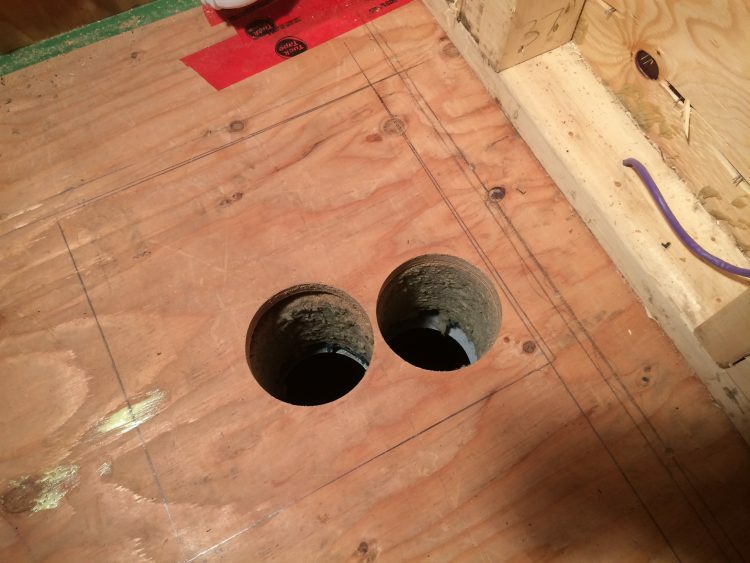 Getting drill happy, next I cut two (of three) big holes in the floor which will accommodate the water heater air intake and exhaust. 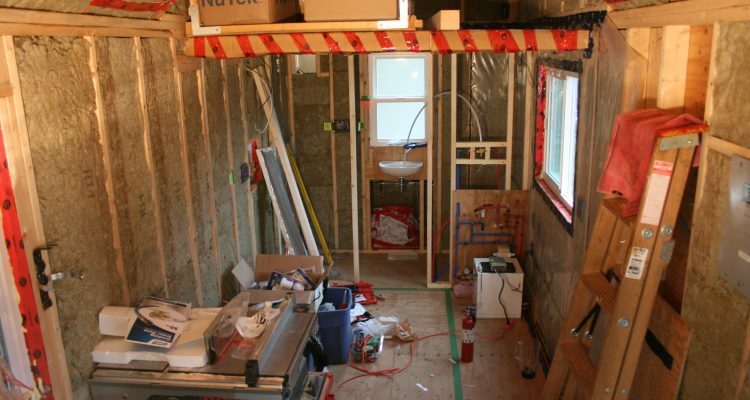 I then finally finishing the plumbing the drain for the shower room sink, something that Brady and I had started around 2 months before! With some of the easier jobs out of the way and nothing else to procrastinate with, it was time to figure out the propane and the rest of the plumbing. This turned in a couple of months of painfully slow progress. With every detail requiring a lot of research, even achieving something small became very difficult. I liken it to building a jigsaw puzzle, when you have never done a jigsaw puzzle before… and with no final picture to guide you! Every time I tried to achieve something I ran in to the same problem: I can’t do X yet because of Y. I can’t do Y yet because of X… etc etc (all of which are things I have never done before). I like to feel like I am making some kind of progress, but in order to achieve anything I must first have a good grasp and make discussions on a whole bunch of other things. Boy it is tough going! 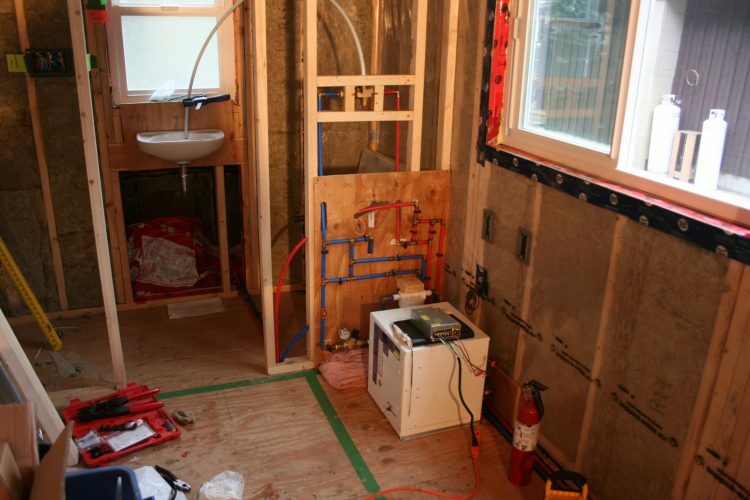 With Christmas fast approaching, in the back of my mind I really wanted to test the hot water heater (which I purchased many months ago), as this would represent (some of) the propane and plumbing systems up and running… and some electrical too. That seemed like a good way to break for Christmas (this wasn’t a Joe-style “deadline”… honest!). This meant I needed to figure out the propane. Which was tough. Luckily my friend Brady was due for a another work visit, so I had someone to share my pain with. 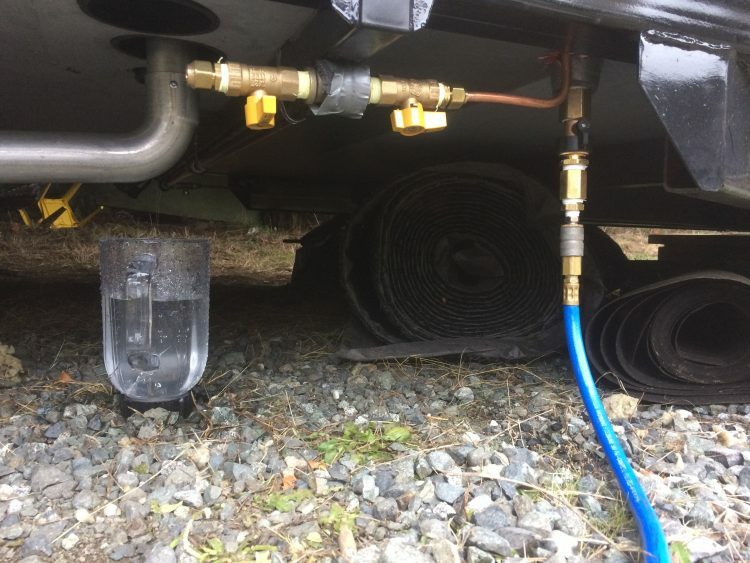 We finally decided on running a solid iron pipe across the trailer and then ‘tapping out’ to flexible copper lines to feed the 3 propane appliances: the hot water heater, furnace and cook top. 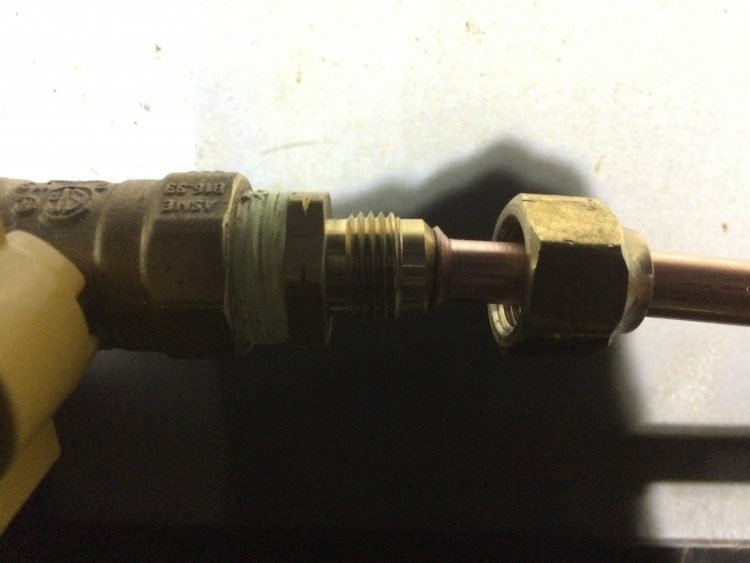 This picture shows the regulator connected to the iron pipe, with the flexible copper lines connect to this pipe through a dedicated shutoff valve. 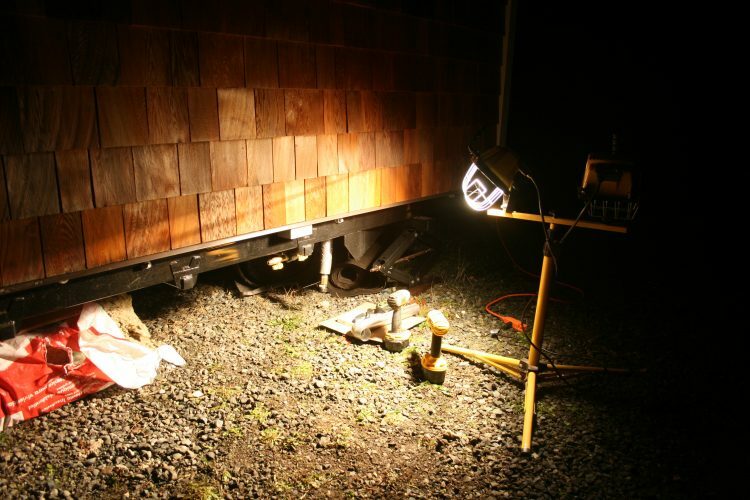 As the days grow shorter I started to spend many a dark hour underneath the trailer by work-light. 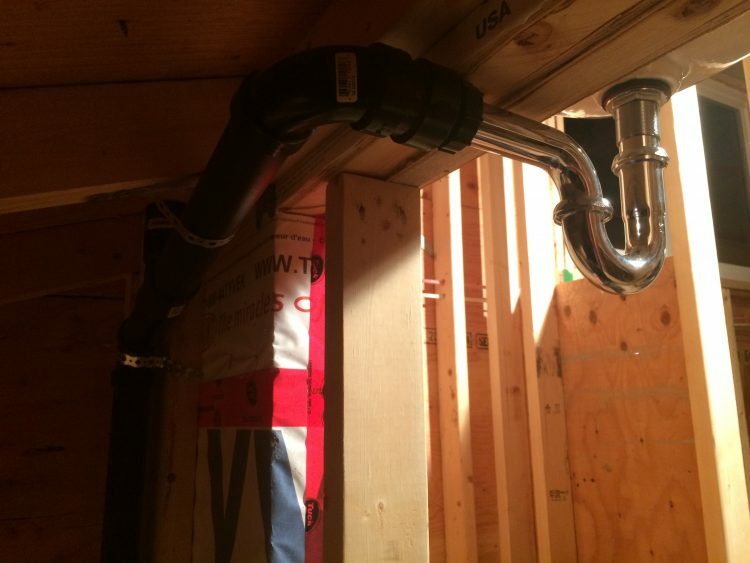 This is a propane line coming in to the house and connecting to the hot water heater. 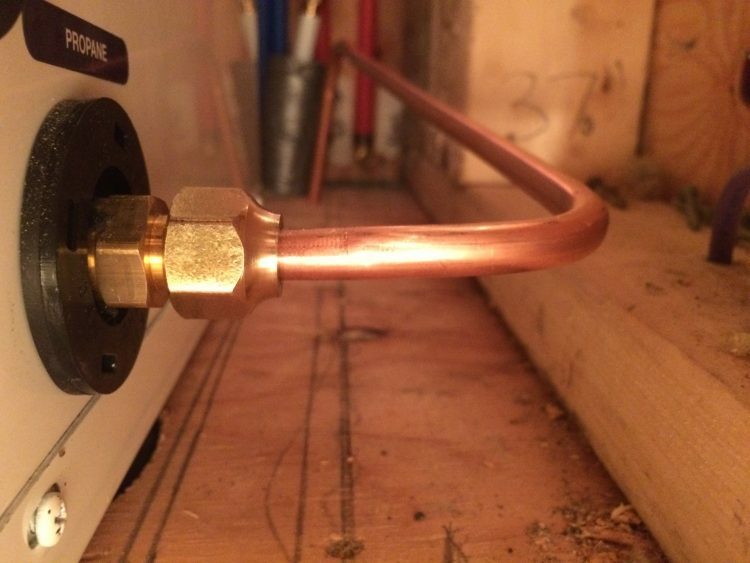 This is what the soft copper ‘flared’ connection looks like, made with a flaring tool (thanks for the loan Jake!). 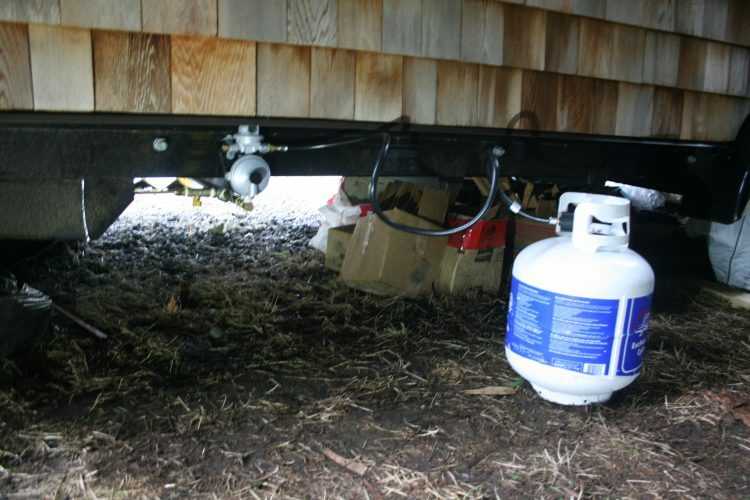 Each connection must be tested for propane leaks using soapy water (bubbles = bad). 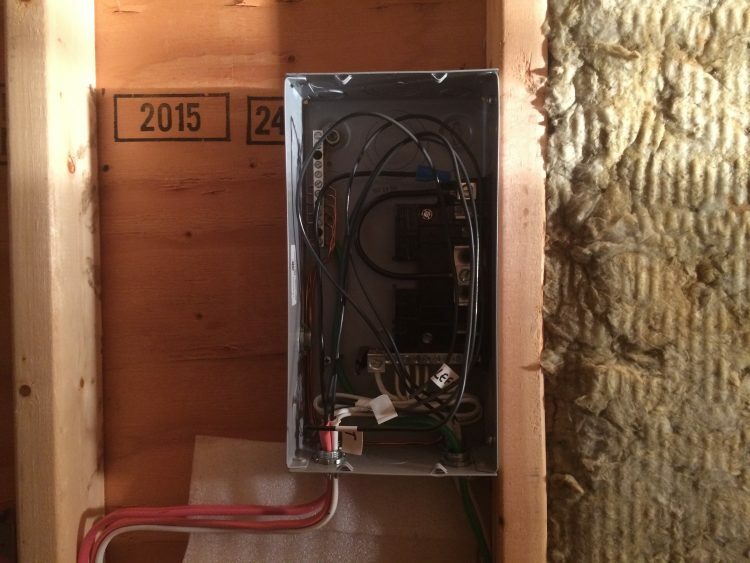 Jake also came back to finish off a couple of wiring things, including installing the smallest electrical panel I could get my hands on to suit our needs. 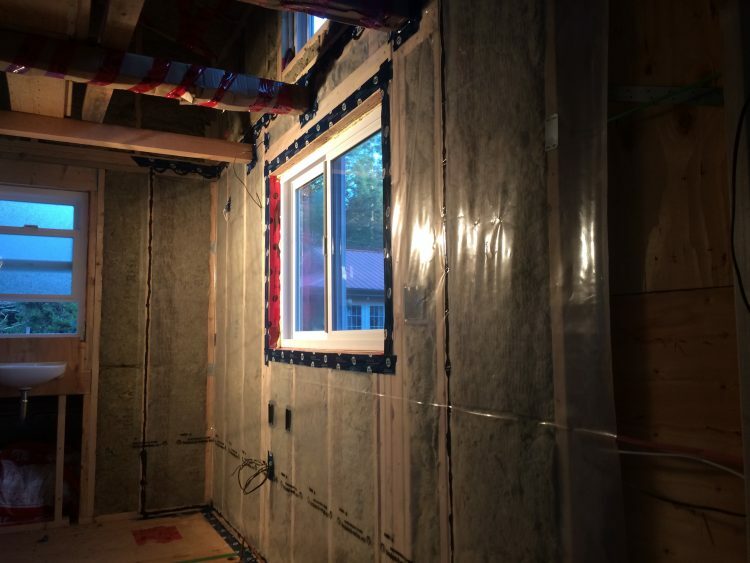 Brady worked like a champion insulating all of the walls and with the wiring completed it was time for the vapour barrier. I decided to just do the one section behind the water heater for now. 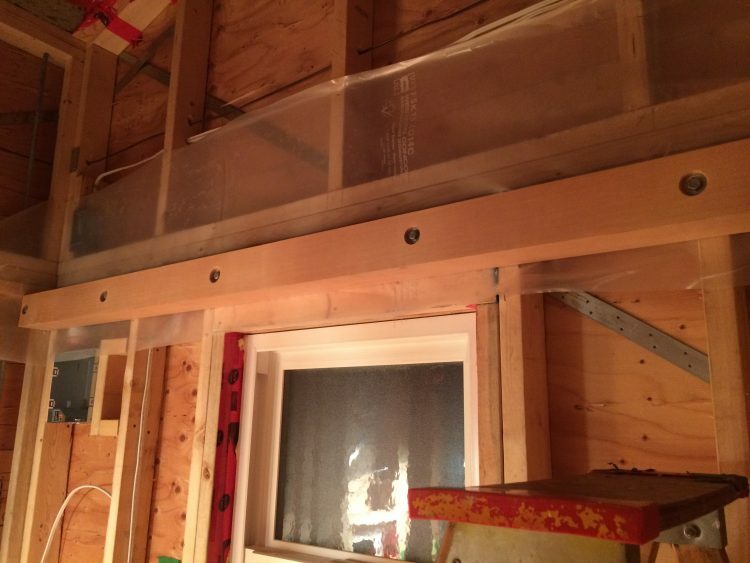 With the vapour barrier on I could finally install the water heater and the plumbing for real. 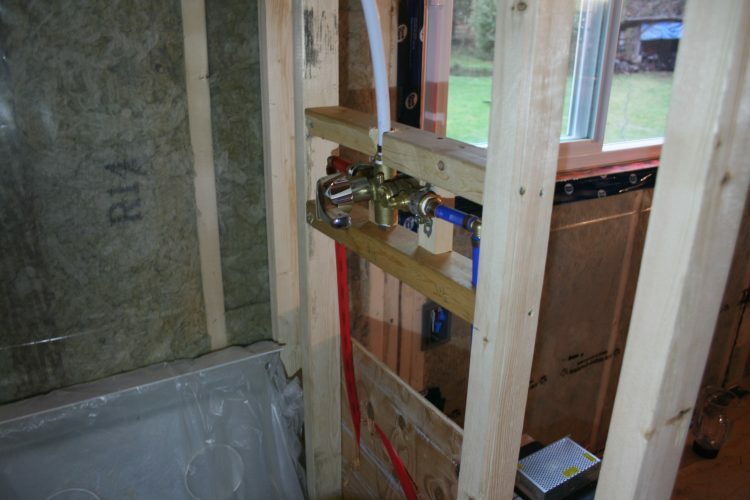 In order to test the water heater, I decided to plumb in the shower valve and run a line from that to the sink so I could easily drain the test water out of the house. Things got a little tight space wise, as I wanted everything contained in a dense (but hopefully maintainable) utility cupboard under the kitchen counter. 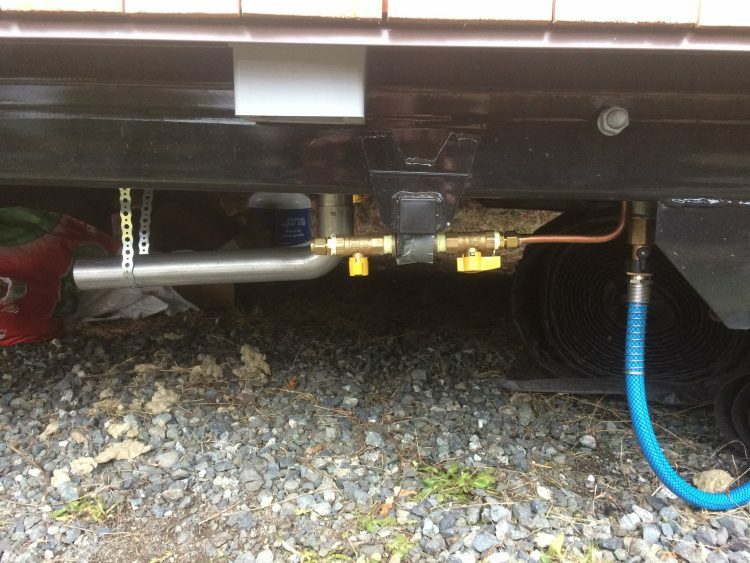 Underneath the trailer, from left to right we have: the water heater exhaust, the propane iron pipe, the copper propane line for the water heater and the hosepipe water hookup. Things were ready to test! I methodically went over each part of the system before letting water in. Everything went well, except a gush of water coming from a single piece of pipe that I had completely neglected to crimp in to place! 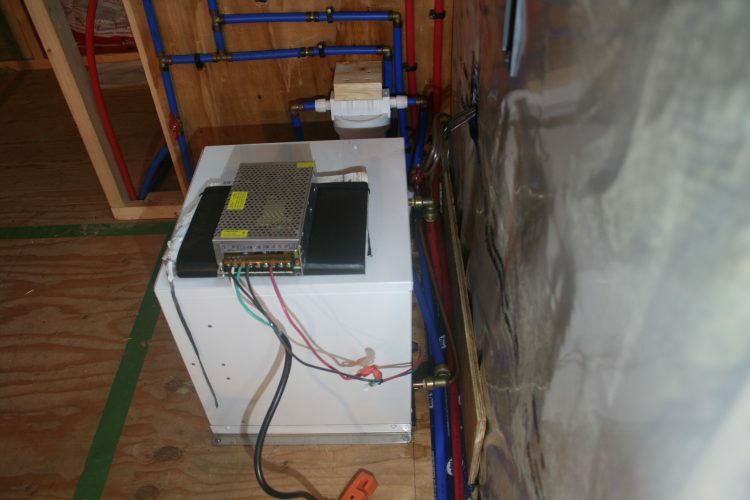 Once that was sorted I then turned on the propane and 12V power supply to the water heater. When I pulled the shower handle, the hot water heater fired right up and almost immediately hot water was coming out. Success!!! 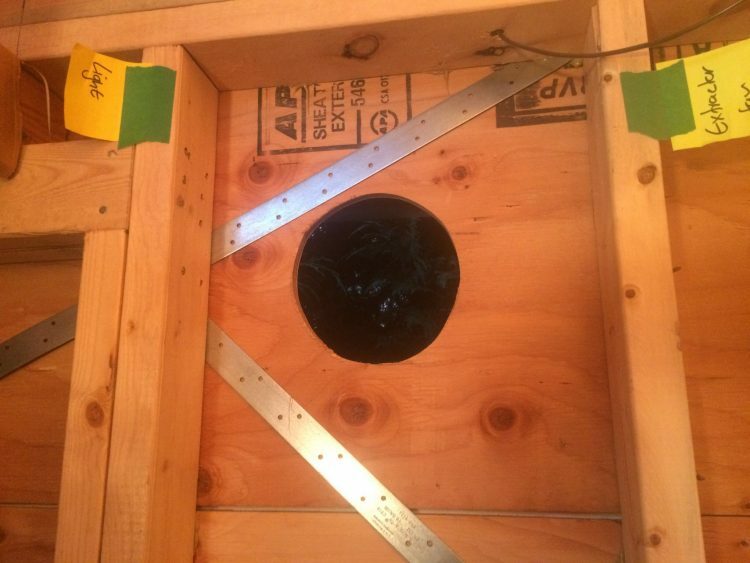 With the plumbing tested, the next step was getting the water out of the house. 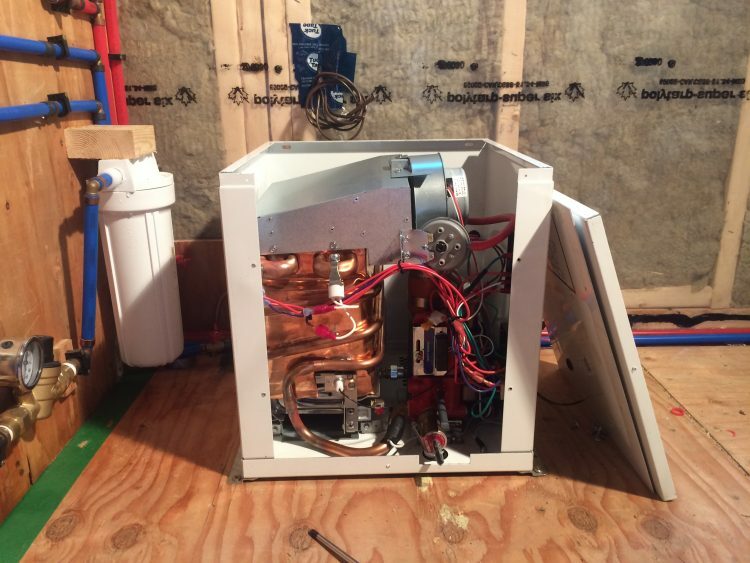 While the hot water heater has an anti-freeze system, this requires the propane, electricity and water to be connected. I am not ready to leave all of these turned on, so not destroying the water heater by allowing it to freeze is pretty important (it is December in Canada after all). 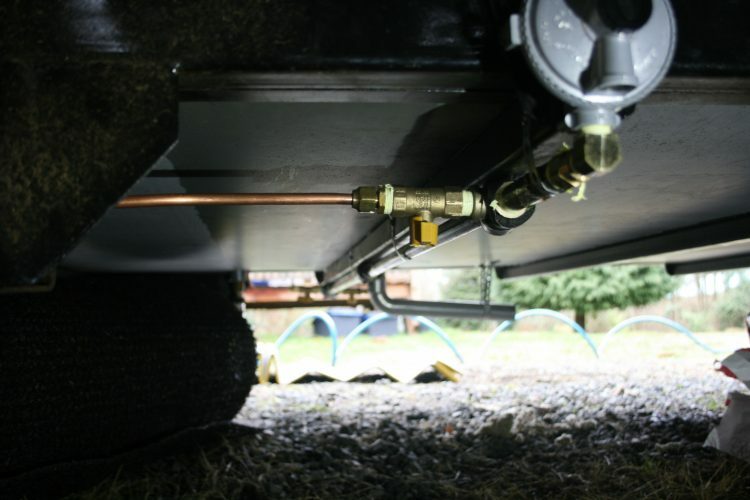 To do this, I created a connector which allowed me to hook up an air compressor to the hosepipe inlet and blow the water out of the system using fairly low pressure air (…YouTube told me this is how you winterise an RV). I had to open up a valve inside in the water heater to allow it to drain fully. Blowing the air through the system was even more nerve wracking then putting water into it, but it did the job. 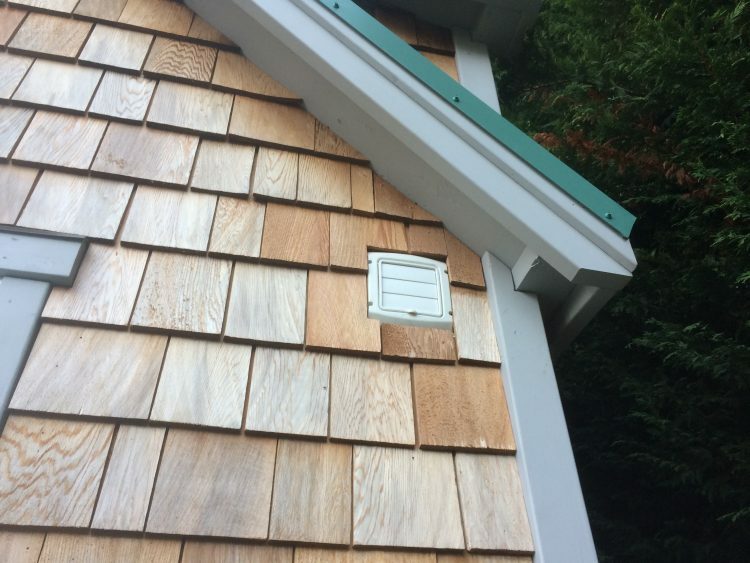 With the system drained it’s time to back away slowly from the project in order to end on a good note. It’s been a tough slog, but I’m very happy to be making some progress one day at a time. Maybe I will finish this thing after all!